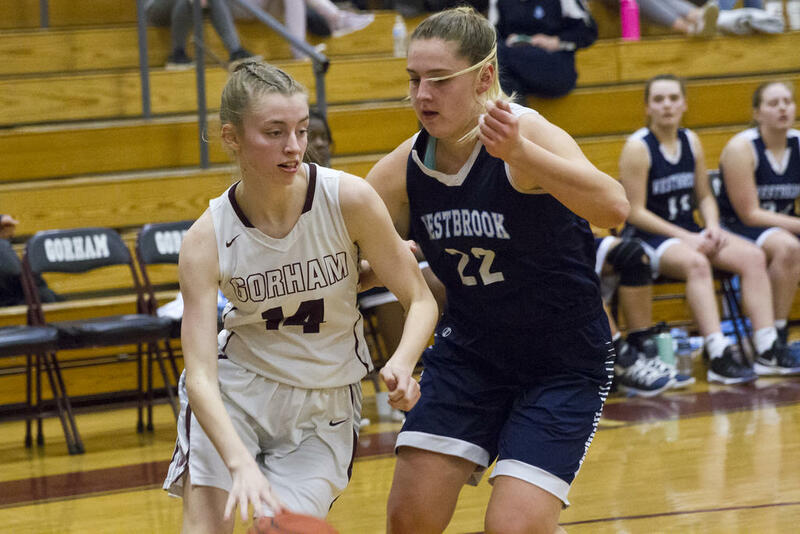 GORHAM—Mackenzie Holmes led the Rams in winning handily over visiting Westbrook on Monday night, Jan. 28. Holmes tallied 27 as Gorham jumped out front of the Blazes from the get-go and never looked back. The Rams opened the evening on a 9-0 run: Adele Nadeau, Holmes and Brittany Desjardins all contributed twos, and Nadeau a three. Westbrooker Avery Tucker then turned a pair of consecutive steals, the first leading to two points by Ariana Alcide and the second leading to two points of Tucker’s own. But Holmes closed the quarter with three-of-four foul-line shooting for a 12-4 advantage. Gorham continued to pile on points in the second, third, and fourth quarters. Holmes spearheaded the charge, but Courtney Brent, Jacqui Hamilton, Anna Nelson and Desjardins contributed points as well. Westbrook put up some points, to be sure; they were too determined not to. But the baskets from Jodi Sinnett, Tucker, Alcide, Libby Cole, Sarah Muka, Quincey Lyden (a great three! ), Mikayla Van Zandt and others came too infrequently for the Blazes to stand a chance. Gorham, now 10-5 on the season, ranks third in AA South at present. The Rams face a couple tough foes in the coming days: South Portland (No. 2, 13-1) on Feb. 1 and Windham (No. 2 in AA North, 10-4) on Feb. 5. They close their regular schedule with TA (No. 3 in AA South, 3-11) on the 7th. The team stumbled at the start of last season but ended up playing State-Final-caliber ball as the tournament dawned, and their hope this year is to do the same. For that to happen, though, their game will need to take a huge leap forward. They may have played solid defense against Westbrook, but defense cannot be stressed enough, come the postseason. Westbrook slips to 3-11. The Blazes occupy 12th in A South, a few slots back from playoffs contention. They meet Kennebunk (No. 4, 8-6) on Jan. 31, Falmouth (No. 11, 1-13) on Feb. 5 and Biddeford (No. 9, 4-10) two days after that. The mathematics of Heal Points is truly arcane, but if Westbrook can pick up – and they appear to have the skillset and heart to do so – another win or two, they might just sneak into the bracketing. Gorham’s Brittany Desjardins fires off a shot over Westbrook defender Libby Cole. Westbrooker Michaela Russell finds herself in the unenviable position of defending against Gorham superstar Mackenzie Holmes. Gorham’s Adele Nadeau pushes along the baseline; Blaze Mikayla Van Zandt defends. Jacqui Hamilton fires off a shot for the Rams. 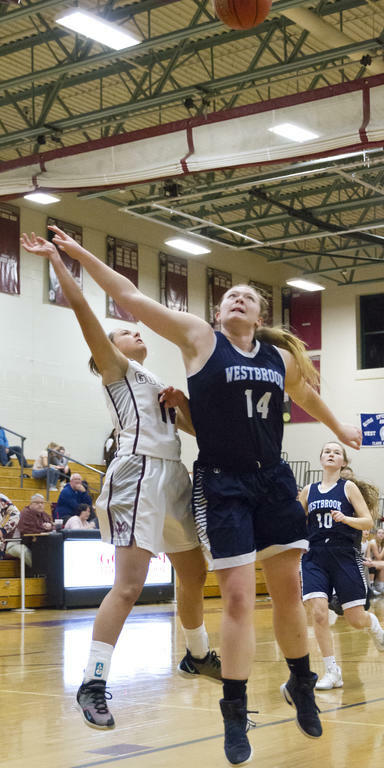 Westbrook’s Sarah Muka tries for two; Gorham’s Sophia Michaud swoops in to thwart her. Gorham’s Lauren Fotter and Westbrook’s Jodi Sinnett clash in midair. Ariana Alcide takes a foul shot for the Blazes.